A skateboarder in a Jesus costume participates in the Halloween Hell Bomb contest on Junipero and Ocean Blvd. Tuesday evening. Video captured by Steven Castellanos Jr. 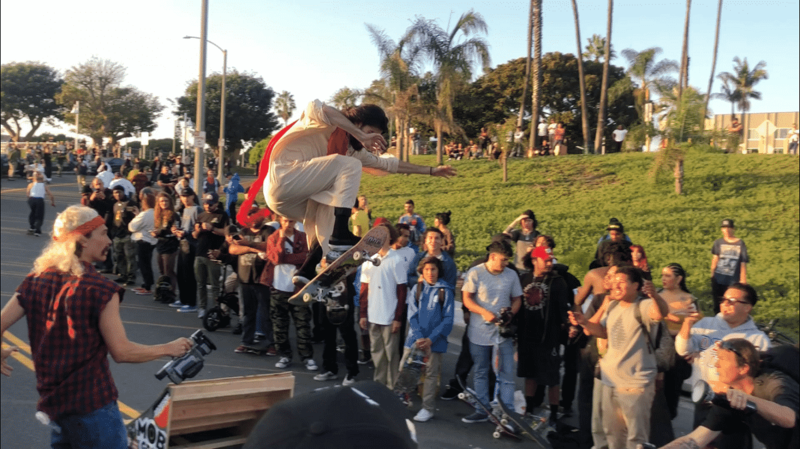 Similar to the Cherry Hill Skate Challenge that took place in June, skateboarders—this time in Halloween costumes, “Shred, Skater Jesus!”—repeatedly launched themselves off a ramp placed in the middle of the street landing tricks for treats or attempting the fastest downhill speed. More than a few participants wiped out to the sounds of a thoroughly engaged crowd. Later, a car was positioned on the course by skater Xavier Alford becoming an even more enticing ramp for those aiming to catch major air and style points.